How to add another computer to my license? All licenses are single user licenses. We cannot add more computers to the license. However, you can purchase another license and assign it to your second email. You’ll be able to use a license on two additional computers and keep control over the licences at one place – your main account. Find out more about how you can assign a license here. You can reassign the license to a different email at any time or you can create a new account at AEJuice and get another license. All products are licensed under a single user license to create an unlimited number of videos for an unlimited number of clients. On how many computers can I use the licensed products? You can use the licensed products on up to 2 computers AT THE SAME TIME and ANY PLACE. You can ONLY use the licensed products on 2 computers registered at AEJuice. Once a Videohive license is activated it’s attached to the computer forever and cannot be transferred to another computer. 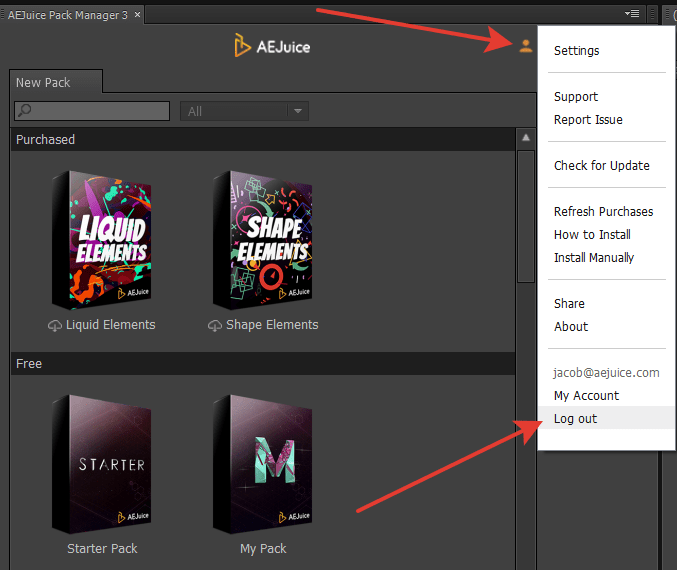 However, you can easily transfer your Videohive license to your AEJuice account, after which you’ll be able to log in and out from the computer. Your license will transfer with you. Do you need more computers? Pack Manager has both free and paid versions. You can use the free packages in both personal and commercial projects, but for the paid packages you`ll need to buy a license. 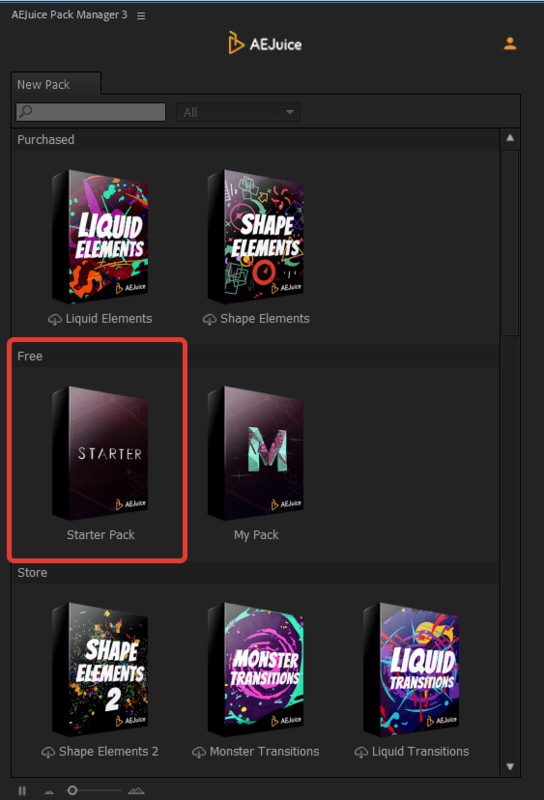 All the free packages are located inside the Starter Pack. or go to Manage Computers page and press “Revoke” near the computer. Once you exceed the limit AEJuice can log out computers automatically so you do not need to worry about logging out. We do not offer separate team\studio\company licenses. However, you can buy multiple licenses and assign them to other people. You need 1 license per person. Learn more about how to assign a license. How to assign a license to my employee\co-worker\freelancer? Once you purchased a license go to Manage Licenses page, enter an email address of your employee\co-worker-freelancer and press Assign. Where can I read full license terms? Now you can log in\log out anytime so the license can travel with you. Please note you can use the license on a maximum of 2 computers at the same time. 1. 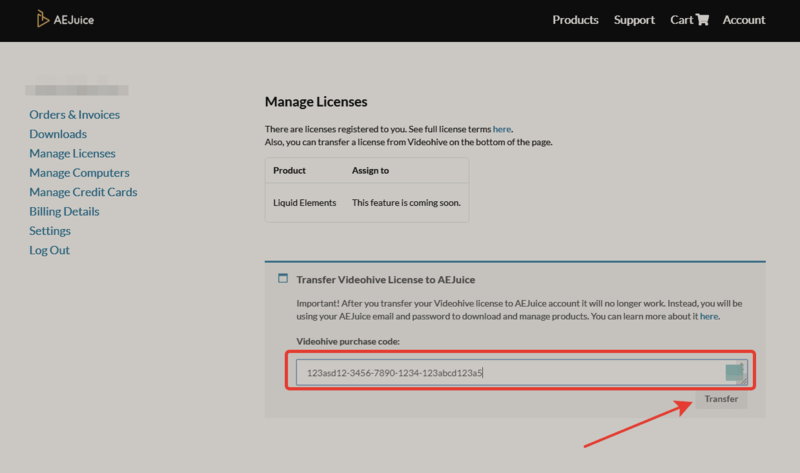 Go to Manage Licenses page (you must be logged it – create an account if you don`t have one yet). 2. Paste your Videohive purchase code at the bottom of the page where it says “Transfer Videohive license to AEJuice”. Important! After you transfer your Videohive license to AEJuice account it will no longer work. Instead, you will be using your AEJuice email and password to download and manage products. After you transfer the license you can log in using your email and password.